We are the Star that make up this “universe” called the Human Race. Maybe a star by itself doesn’t generate enough light to light the path we’re looking for, but on 21st December we’ll all go out together… joining all of that positive energy, making a big star… and demanding a change in the bad direction of mankind. 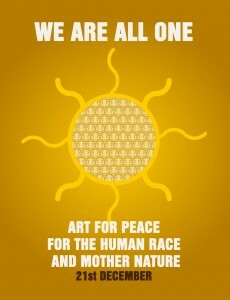 A call for humanity, asking for love and respect for Mother Nature!!! Our claim is through art (essential for necessary human progress). We invite you to take part in this day by making your own work: a SUN (in poetry, drawing, photography…). Let’s light up the streets and the net with our suns (in the streets go and see other “suns”, on the net, upload a photo of your work onto the blog…). If you don’t like the idea of a sun, then is doesn’t matter, power to the imagination. Anything you do will be good, as long as it’s done with respect and not violence. Let’s make it clear that we want a fairer world!! !